BYTON at CES 2019: sneak peek of its production model. 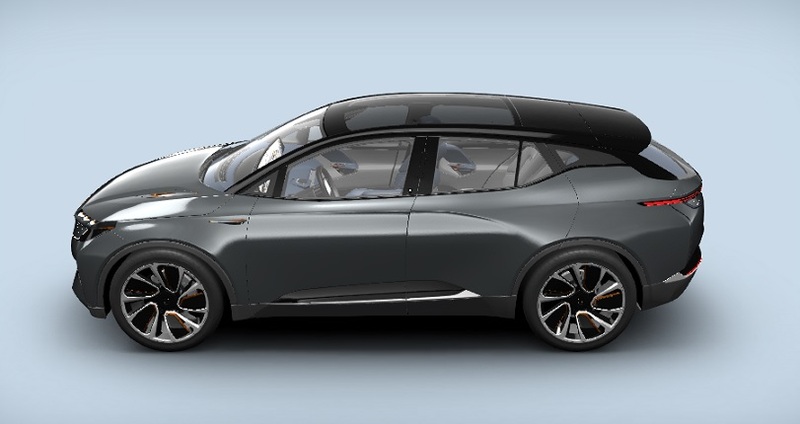 Premium smart EV brand BYTON showcased the latest progress made on its first production car, including a new front-row design and new intelligent human machine interface (HMI) technologies, at the 2019 International Consumer Electronics Show (CES) in Las Vegas, one year after its world premiere at the event. BYTON positions its products as “next generation smart devices” and is committed to combining automotive engineering with the latest digital technologies to provide a pleasant mobility experience empowered by technology. BYTON also unveiled more personalized, connected applications and services that will be applied in its production cars based on the BYTON Hybrid Cloud, as well as new technologies like BYTON Intuitive Access. BYTON targets to start series production of its first premium smart electric SUV by the end of 2019. The company is currently building an intelligent manufacturing base in line with Industry 4.0 standards in Nanjing, where the building enclosure of the plant has been almost completed and equipment installation has started. Vehicle testing is already in full swing, with nearly 100 prototype cars being put into a series of various tests. BYTON aims to create a premium brand rooted in China which has a global reach. Its global headquarters, intelligent manufacturing base and R&D center are located in Nanjing, China, while its North American headquarters, devoted to intelligent car experience, autonomous driving, whole vehicle integration and other cutting-edge technologies, is based in the Silicon Valley. The company’s vehicle concept and design center is located in Munich. BYTON also has offices in Beijing, Shanghai and Hong Kong to handle external affairs, marketing, sales, design and investor relations. BYTON’s core management team is made up of the world’s top experts from China, Europe and the U.S., all of whom have held senior management positions in innovative companies such as BMW, Tesla, Google and Apple. Their expertise covers automotive design, automotive engineering and manufacturing, electric powertrain, intelligent connectivity, autonomous driving, user interface and supply chain management among other industry sectors, the sum of which represents BYTON’s strengths in manufacturing premium automobiles that are equipped with high quality internet technologies. These cars are not yet on sale. They do not have type approval and are therefore not subject to Directive 1999/94/EC.